Top tip: check the Environment Agency website to check whether the coast you’re staying near has high quality bathing water. Most of us would prefer to avoid eating food which is near sewage pipes. Mussels are filter feeders, so what’s in the water will be in your dinner! If the Environment Agency shows the local sea to be safe for bathing, it’s unlikely to be suffering from toxic red algae blooms! Take your pick: you’ll find mussels on rocky outcrops on low tides. Gather large specimens which will have a better developed flavour, and avoid ones with broken shells. If they’re open, give them a tap and if they don’t close, don’t pick them. Carry them to where you’re cooking in a bucket (or similar container) filled with sea water to keep them fresh. Preparing your mussels: rinse and scrub the mussels and use a penknife (or that bushcraft knife… any excuse) to pull away the mussels’ beards and scrape off any barnacles. Some of us are better with a beard but mussels are an exception. Once again, if any of the mussels are open, give them a tap, and if they don’t close, discard them. Next you have a number of ways to cook them! We like to cook ours straight on a fire. All you need is enough wood to get a fire going. Sometimes you can find dry, washed up driftwood which serves this purpose. We carry homemade firelighters with us so we can knock up an instant cooked meal on the beach from nature’s larder. If there’s no firewood to hand, then we take them back to the campsite. 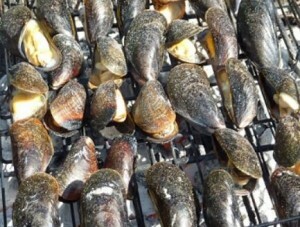 You can put the mussels straight on hot coals, and the moisture in their shells steams them, with the shells opening once the mussels are cooked. You really couldn’t get any fresher. No need for a fork either, as the shells can be used to pick out the flesh. Do be careful when picking the mussels off the coals. A stick can also be used to ‘flick’ them onto something ideally not covered in sand! Even better, have a small metal grill in your bag or rucksack, but again, watch your fingers when taking the mussels off the grill as the shells get hot. Still hungry? Send the kids off to gather more! 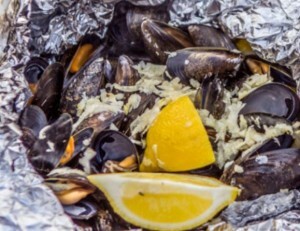 If the mussels don’t open fully during cooking, don’t eat them. Back at your campsite, you can indulge yourself a little more. Take a bowl and line it with a large folded over sheet of tinfoil. Leave plenty hanging over the side as you’ll need to make a sealed contained out of the foil. Clean and prepare the mussels. Then fill the bowl. Add chopped garlic and a good slug of white wine. Now make your tinfoil container airtight by crimping and folding. Make sure the wine can’t leak out! Place the foil bag directly on a grill on top of your fire, and cook for eight to ten minutes. Lift from the fire, open the bag, and pick to your heart’s delight (or until all the mussels are gone). Again, save washing up by using the shells to pick the meat. There’s always a degree of risk with shellfish. For us, the risk is worth it. It’s always worth having Imodium in your first aid kit just in case!